Valley International Airport officials are presented with a $14,748 rebate check from Schneider Electric. We are thrilled to mark this historic day in our nearly 15-year partnership with Schneider Electric. 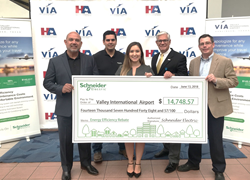 Energy and sustainability expert Schneider Electric today announced that Valley International Airport in Harlingen, Texas has achieved nearly $15,000 in energy savings in the latest phase of a comprehensive energy efficiency project. Schneider Electric presented a rebate check to airport and city officials at an event in the airport’s main concourse. In total, the multi-phase project will deliver an estimated $1.58 million in savings and reduce the airport’s annual utility expenses by 38 percent. Schneider Electric has partnered with Valley International Airport since 2005, when it began work on the first phase of the project, which focused on replacement of the airport’s existing building automation system and lighting fixtures. This phase delivered $1.1 million in guaranteed savings and was funded through an energy savings performance contract (ESPC), which uses projected utility savings to pay for infrastructure improvements. A third phase of the project will begin later this year and will focus on replacements of fan coils, further improving comfort for travelers and airport workers. The project builds on Schneider Electric’s expertise in delivering energy efficiency solutions in Texas, having implemented over 236 energy efficiency projects for over $350 million in total achieved savings throughout the state. In addition to its work with Valley International Airport, Schneider Electric has recently partnered with Scurry-Rosser Independent School District, the City of Raymondville and Webb County. Over the past 25 years, Schneider Electric has successfully implemented more than 700 ESPC projects across the nation, saving its clients nearly $2 billion. This project delivery method helps publicly funded entities make capital improvements over longer payback periods and offers many long-term benefits such as improved facility efficiency, occupant comfort, financial management and environmental protection.